Remember when Rockford MI adolescents undergoing orthodontic treatment were mortified by their metal mouth? Thankfully, those days are over. 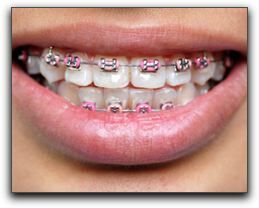 With the new and innovative methods braces can be very descrete. At the office of Bruce A. Stewart and Eric Hull there are two great options–Invisalign and Six Month Smile. Both are very unnoticeable. There are some kids (and many adults!) that are not thrilled about having metallic fuchsia bands and neon yellow wires adorning their teeth. Discrete Invisalign aligners are virtually undetectable and straighten teeth just as quickly and effectively as metal braces. Another benefit of the Invisalign system is that the aligners are not permanently attached to the teeth. Invisalign aligners are easily slipped out for brushing, flossing, meals, and sports. If your Comstock Park child plays a musical instrument that defies traditional braces, removable aligners may be the best option. Six Months Smiles uses traditional orthodontic methods but with modern materials. The brackets and wires are nearly invisible and better yet the average treatment time is only six months long. You should talk to your family dentist to find out if this innovative procedure will work for your smile. If you or one of your children need orthodontic treatment in the Rockford MI area, call Stewart & Hull at 616-827-7019 to schedule a consultation with Bruce Stewart. Stewart & Hull is located at 769 York Creek Dr NW in Comstock Park. We also provide comprehensive restorative and cosmetic dentistry. If you need affordable state-of-the-art dental care in Comstock Park, let us tell you about our financing options.